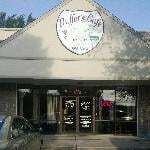 Image of front of Duffers resturant. it today. In any case, the three of us had a great discussion and learned some interesting things about each other. Both Dennis and Dixie have been fasting for a while and agree with the health benefits of practicing a fasting lifestyle. Dennis is a Type 2 diabetic like myself. I had a great breakfast of a western omelette with mushrooms and avocado and ham and sausage. Dennis treated himself with a very rare serving of biscuits and sausage gravy with eggs. Unfortunately, Dixie has food allergies and mostly eats meals prepared at home. We all agreed that having supportive spouses helped with being able to eat this lifestyle (or not eating, as the case may be). I also had some print outs of various articles on the health benefits of Intermittent Fasting. There are links to the same articles on the Fasting Resource page of this blog site. I shared the good results from my different blood tests from before and after I began intermittent fasting with the group. You can see those numbers in this previous post on my Growing Old With Diabetes blog site. Dennis also reported improved test results from his fasting. Get off my diabetic drugs, especially the expensive insulins. Lose weight and conquer my insulin resistance. My weight goal is to reach 145 – which I weighed in my mid-30’s. Get out of this wheelchair I’ve been in since the winter of 2014. Interestingly enough, both Dennis and I have the same general physician here in Bella Vista. When Dennis talked about his fasting, Dr. Estes confirmed that he had other patients using fasting to help with their diabetes also. So there is at least one doc here that is having patients with this lifestyle and is accepting of it. That’s good to know. We agreed to continue with meeting on a Thursday morning at Duffers for now. So our next meeting is scheduled for Thursday, May 18th at 8:00 am at Duffers again. I plan on researching a specific topic on a benefit of Intermittent Fasting and discussing it at the May meeting. How about learning more about “autophagy?” Or is there another topic you would like to know more about? I’m hoping to reach out in this area to more people who are practicing the fasting lifestyle or who would like to try it. I especially would like to reach out to Type 2 diabetics since this is a wonderful way and the only way I’ve found that gives me hope of overcoming this awful disease and its complications. Thanks for looking at my site and coming to this page. I would love for you to leave any questions or comments below. In addition, I’m open to new topics to research and comment on as they pertain to fasting, both extended and intermittent. Please share your interests and questions in your comments. I also love to hear stories about how others handle their own fasting journey. Also, feel free to share this page with your friends via the social icons above this post. I will be sending out a monthly newsletter starting in the summer of 2017. If you would like to receive that email newsletter, you can sign up here.